Founded in 2009, AuthenticPlays provides YouTube views, likes, subscribers, shares, and video comments. They claim to do this through ‘content blockers,’ and poorly explain how this system works. Despite its affordable rates, starting at $5 for 2,500 views, the quality of their service is unsatisfactory. Their customer service appears to be non-existent, they have no written customer protection policies, and their website runs on an expired HTTPS certificate. We can not recommend Authentic Plays, and encourage you to visit our list of the top YouTube providers for a much better choice. AuthenticPlays have been around since 2009. Given their name, they started out with SoundCloud plays, but have since expanded to offer Twitter, Facebook, Instagram, and the YouTube services which are the focus of this review. Their website claims to offer 24/7 customer support, and that they use ‘content blockers’ to deliver their services. In all out years in the industry, we’ve never heard the term ‘content blockers’ used this way before. Their explanation of it makes even less sense to us. 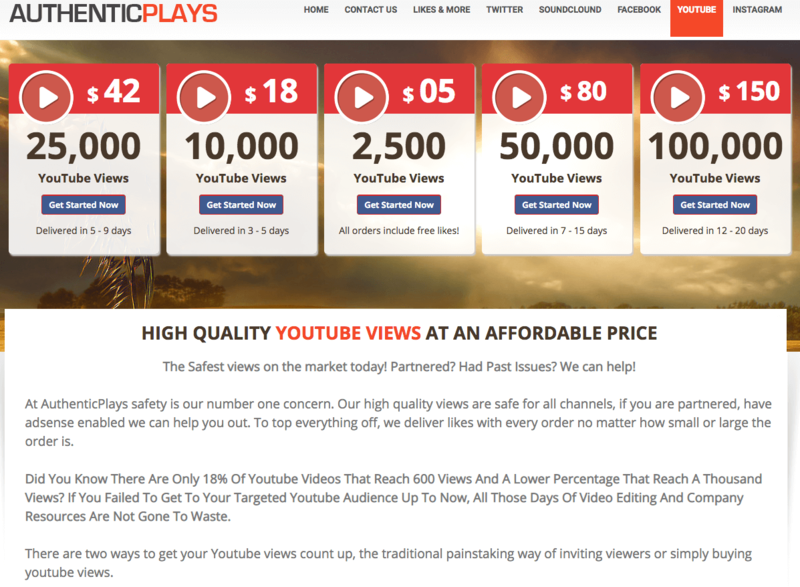 AuthenticPlays offers YouTube views in packages ranging from 2500 views to 100,000 views. Their stated delivery times start at same-day for 2,500 views, and up to 20 days for 100,000 views. 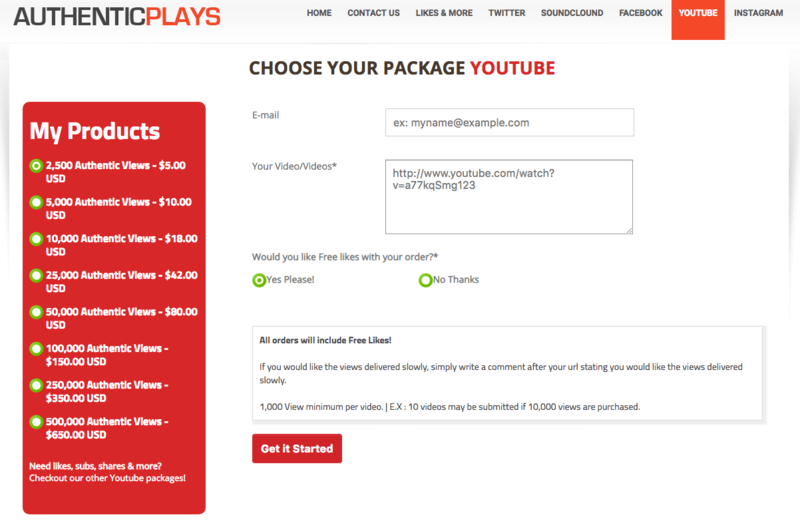 To buy YouTube views, you simply enter your email, provider the video URL, select whether you want free likes (you do), and pay. They offer on other services for YouTube. We reviewed the terms and conditions sections on the Authentic Plays website and made a few comments on their status below. To find out more details on these, then please toggle the sections to see what we thought! There is no terms of service page on AuthenticPlays’ website. Their page for YouTube views has many promises and guarantees on it, but it’s a convoluted mess to sort out what any of it means. There is no refund policy on their site. They do state on their homepage in a short blurb that they have a “100% money back guarantee for all orders,” but give no details on the stipulations for this, or the method of obtaining one. They have no retention policy, or any statements regarding it, anywhere on their website. The website has a live chat box, but the status bar is always set to offline. WE checked in a number of times, but none of their staff is available to answer questions. The chat box prompts users to input their email and indicate their concerns. Unfortunately, the company does not respond within a reasonable amount of time to our standards. They wrote an email address in their header; info.authenticplays.com. Anyone will see that this is not a valid email address as it doesn’t have the @ symbol. There’s also a phone number, (202)-241-4870, which will likely ring forever if you call it. While AuthenticPlays makes many promises of quality services, all we see is a site with no explanation as to how they work which operates on an expired HTTPS certificate. These deficiencies show that the AuthenticPlays is unsafe, and possibly harmful to your interests. We recommend that you see our list of the Top YouTube Views providers for a better choice, and not visit their site. Their claimed turnaround time varies from the same day, and up to 20 days for 100,000 views. This is an average claimed time for the industry. 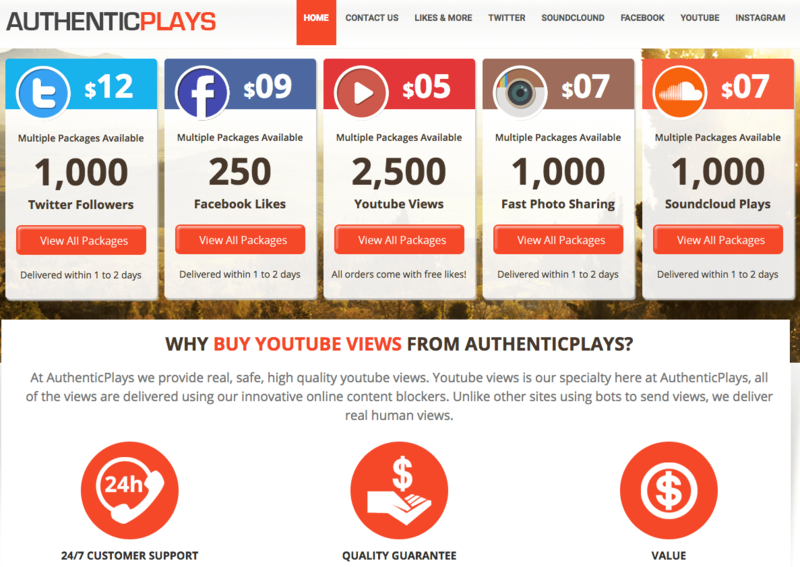 AuthenticPlays claims to provider real human viewers using their ‘content blockers’ tool. We haven’t heard this term being used in this manner before, and are stumped. They tried to explain it this way: “Each user is required to watch/follow/like/ or subscribe to your page in order to access a certain online page such as a movie, file, article, etc. We ensure all views/followers, and services are of the highest quality.” What does this have to do with ‘content blockers?’ We have no idea. Authentic Plays do not make any comments on their retention rates, which is troubling. AuthenticPlays promises its clients impressive results for all its social media marketing tools. Our analysis of their service has shown them to be one of the most bizarre providers out there, and not in a way we’d recommend them to be. The company has terrible customer support. 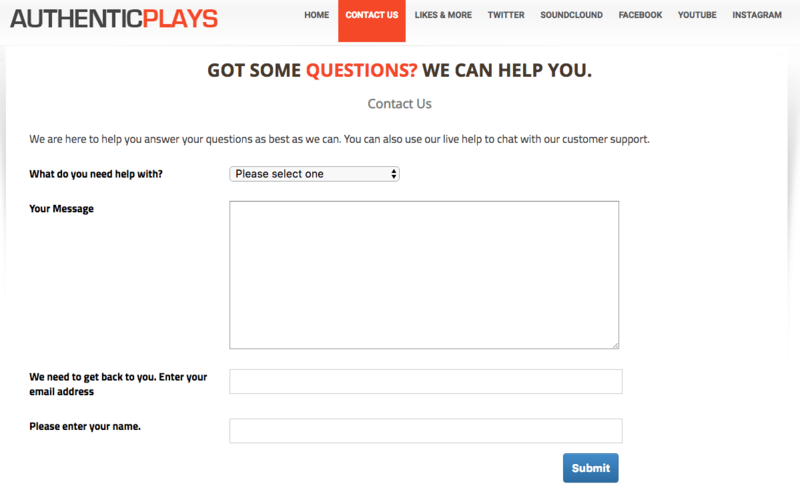 Their live chat always shows an offline status. The staff's responsiveness to inquiries is always delayed. They operate on an expired HTTPS certificate which shows lack of credibility. We believe that you should not visit their site, and should instead visit our list of the Best YouTube Views providers for a company which is worth your trust.